Wine knowledge is an essential part of making money behind the bar. Although it takes a lifetime to really learn all there is about wine, we can really move students through the essential bits of wine knowledge in a few hours. Our instructor is a sommelier and truly passionate about wine and teaching students on how to appreciate the grape-based beverage. Over 2.5 hours we talk and taste a half dozen very different wines. We key in on what a knowledgeable guest looks for so you also know how to sell a glass or bottle! 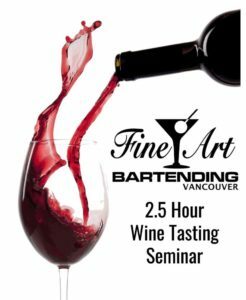 Where our Commercial Bartending Course outlines the basics on wine, plus some wine service notes, this class demonstrates the nuances of suggesting wines to pair with different meals. It outlines how to appreciate different elements of a wine and what terminology to toss out there when suggesting a wine for a guest. This is an excellent adder to the cocktails we focus on during the main course, and each bartender interested in making more money can really benefit from learning a bit about wine. Regular price is $79. STUDENT SPECIAL only $49 per person. Bring along a friend too for this special price!